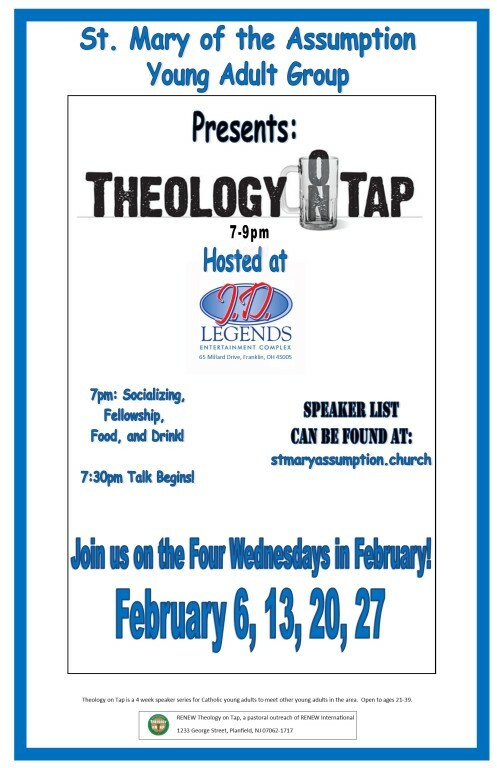 THEOLOGY ON TAP is a 4 week speaker series for Catholic young adults (20s-30s) to socialize and to meet other young adults. Come at 7 p.m. for socializing, food, and drinks. The talks start at 7:30 p.m.
February 6: John Leyendecker - "Would Pope Francis Smoke Weed with me?" John Leyendecker, having encountered Jesus in the Eucharist, became Catholic in 1999 after a very prodigal life. Witnessing a family tragedy at 12 years old lead him to a life of vice and confusion. It is from this place of brokenness that John shares what Christ has done in his life. He studied classics and theology at Xavier University and has done graduate work at the Athenaeum of Ohio. Working as a full-time youth minister for four years, seven years as a Team Director for FOCUS, and training people across the country in evangelization and discipleship has equipped John and made him even more passionate for the work of the New Evangelization. John joined the School of Faith team July 2014 and currently, he and his wife, Lisa, reside in Cincinnati area with their seven children. February 13: Matt Scherr - "Dynamic Catholic -- re-energizing the Catholic Church in America"
Matt Scherr was born and raised in western New York. Despite growing up in a strong Catholic family, Matt became disengaged with the faith throughout his high school and college years. It wasn’t until he stumbled upon some of Matthew Kelly’s books that Matt began to turn his life around and re-engage with his Catholic faith. In 2015, Matt began working with Matthew Kelly at The Dynamic Catholic Institute, a nonprofit organization with a mission to re-energize the Catholic Church in America by developing world-class resources that inspire people to rediscover the genius of Catholicism. Each year, Dynamic Catholic touches millions of people with life-changing Catholic content. Dynamic Catholic is now serving more than 12,000 of the 15,000 Catholic parishes in the United States. Matt is deeply concerned about the modern culture that is prevailing in society. He has witnessed countless family and friends turn their backs on their Catholic faith. His work at Dynamic Catholic is fueled by his love for Christ, his desire to re-engage disengaged family and friends, and his passion to create a more vibrant Church for the children of today and generations to come. Ryan Mahle was born here in Dayton, OH, attended Alter High School where he played baseball, before moving on to play and study at Ohio Northern University. While at Ohio Northern he started to have a change of heart in his faith while graduating with his Civil Engineering Degree from ONU. Ryan became very successful in his engineering career, while also growing in his faith, and became the volunteer Youth Minister for Immaculate Conception. Eventually, Ryan felt the call to move into ministry full time as a Theology Teacher at Alter HS, while beginning his Master's Degree in Theology from Franciscan University. However, he would tell you his greatest accomplishment has been marrying is amazing wife Rachel, and the birth of his children! Over the course of the last few years, Ryan has become an accomplished speaker, presenter, and mentor to many about the Catholic Faith. He left Alter HS at the end of the 2017-18 school year to begin working for the Archdiocese of Cincinnati in the Office of New Evangelization as well as Marriage Preparation and Theology of the Body Development! Ryan has previosuly spoken at one of the Young Adult's "First Tuesday Dinners" at St. Mary of the Assumption. February 27: Rob Goodale - Theology Teacher at Fenwick High School ~ "Harry Potter and Christianity." Rob Goodale is a theology teacher at Bishop Fenwick High School and a graduate of the Echo Program at the University of Notre Dame. ©2019 St. Mary of the Assumption Catholic Parish All Rights Reserved.